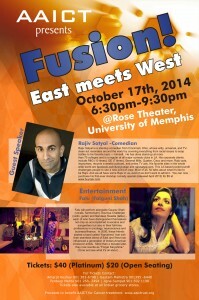 An evening to relax and unwind with non-stop laughter with Rajiv Satyal. Rajiv’s witty, universal and TV-clean act resonates around the world by covering everything from racial issues to soap bottles to his favorite topic – himself. He has performed everywhere from Boston to Bangalore and has been featured in The Wall Street Journal and LA times and opened for Russell Peters, Dave Chappelle, Kevin Nealon, Tim Allen, and Daniel Tosh in theaters across USA. Also presenting entertaining music by Singer Falu Shah, internationally recognized for her rare ability to seamlessly blend modern inventive style with a formidable Indian classically-shaped vocal talent. Falguni (aka Falu) studied under legendary sarang/vocal master Ustad Sultan Khan. Falu’s subsequent career in the States had led to a series of brilliant and high profile collaborations with Yo-Yo Ma, Wyclef jean, Philip Glass, Ricky Martin, Blues Traveler and A. R. Rahman amongst others. She was appointed Carnegie Halls ambassador of Indian Music in 2006. One of Falu’s most astonishing performances occurred alongside A.R. Rahman for President Obama and the First Lady Michelle Obama at the White House for their First State dinner in Nov 2009. Falu’s band of the same name includes musicians who draw from Indian classical, alternative rock, contemporary pop, and electronic styles to create a mix of East and West – one reason why The New York Times featured Falu in a story titled “Bridging Cultural Gaps with Music. Sandeep Swadia, a protege of Zakir Hussein will accompany Falu during the concert. Tickets are $40.00 for platinum seating and $20 for general seating. The show will start promptly at 6:30 p.m.
Corporate sponsorships are still available! Sponsorships of $500 to $999 will receive 4 Platinum seats and $1000 or more will receive 6 platinum seats and a VIP back stage pass. Looking forward to your support to help raise funds for the children suffering from cancer! For more information, visit us at www.aaictrust.org. TAAL 2012 – A Recap….